Recently, I had the awesome chance to make friends with another artist and show him around East Tennessee. 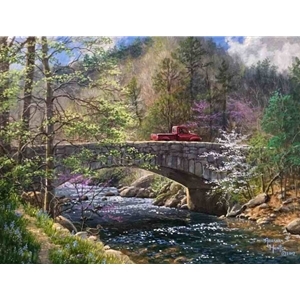 One day, we were out looking for a place to paint, and we saw this bridge on our way to Cades Cove. Weighed down with equipment, we jumped out of the truck to start painting. I finished the piece on location, but when I got it back to the studio, I wanted to tell a story. I chose to go back in time to the 50s when the mountains were less populated and touristy. This old pickup truck is chugging across the bridge with fishing poles in the bed. It seems they have a fun day planned. Meanwhile, down on the riverbank, a mother duck has brought her little babies out to play. Spring is an awesome time for outdoor adventure!